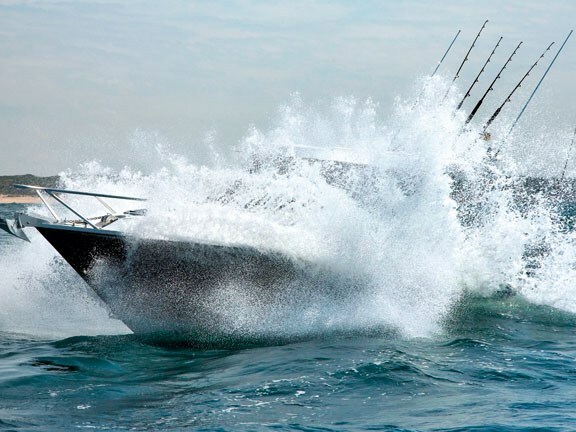 After giving the New Zealand-built White Pointer 750 Sports Hardtop a thumping through the notorious heads of Victoria’s Port Phillip Bay, I have to admit that aluminium boat manufacturing has reached a pinnacle. This plate-aluminium battleship is built for long, hard offshore expeditions, at the same time offering a level of comfort in the slop that’s hard to match. It’s solid and surefooted, with a terrific ride that fills you with confidence. 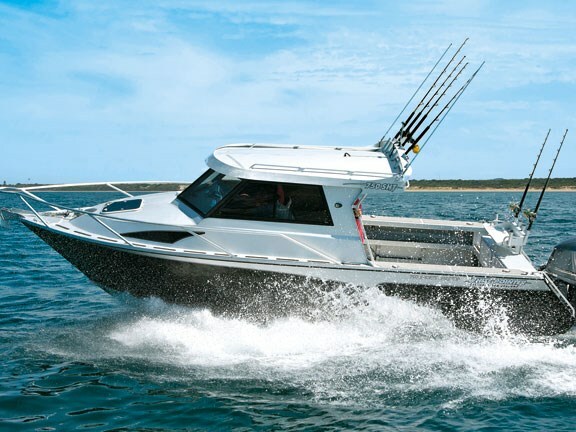 This purpose-built fishing and diving machine displays excellent manoeuvrability at all speeds and combines huge a workspace with plenty of storage and comfort. There’s a secret to this boat’s construction. It’s all to do with building from the inside out. This method ensures all White Pointer boats are built to the same specifications from precision jigs, allowing the 6mm bottom sheets and 4mm side sheets to be curved, delivering a better ride and greater strength. Is it the best aluminium boat I’ve tested? 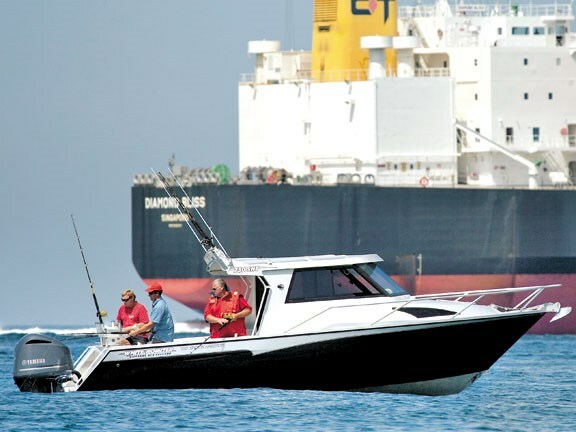 Yes — I believe it’s superior to other boats I’ve previously sold, driven and tested in this size and style. At Phillip Bay the White Pointer chewed the conditions up and spat them out in a powerful fury, aided by the gutsy efficiency of a Yamaha 250hp four-stroke engine. At all times the boat felt safe and secure; I never even left the driver’s seat. Sure, we took some water over the top, as you would expect when playing amongst the turmoil, but certainly no more than expected. We pushed the hull hard to try to find fault, but our search was in vain. We did have a small problem with cavitation — the boys had the engine set a little high — but that’s an issue easily overcome with a little more fine-tuning. There’s storage everywhere you look. There are deep sidepockets throughout the boat and twin shelves on each side in the cabin, the latter lending additional strength to the bow. There are two stepped seat modules in the cockpit with four plastic moulded seats. The transom layout works really well, with a small doorway leading to a step and a strong dive ladder. There are cabinet enclosures for the batteries and plumbing, and a livebait tank is available as an option. You’ll notice the strong rolled edges on the wide coamings, while the unmasked welds are some of the best I’ve ever seen. 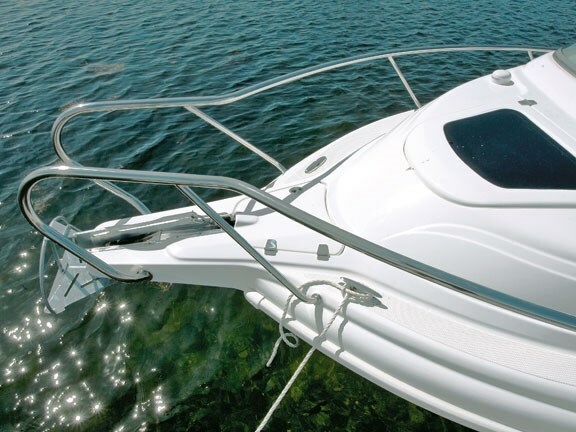 The 18° vee at the transom gives a good blend of ride versus stability, and the high coaming here has a minimum height of 750mm. Scuppers or a selfdraining cockpit are available as an option, but this raises the floor height considerably, reducing stability in the process. 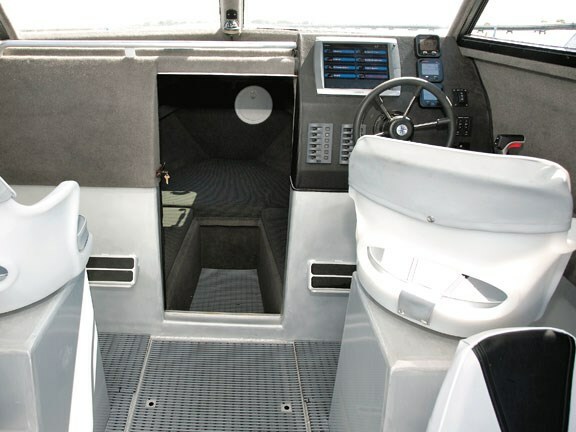 The deck drains to its own sump with a large bilgepump, and the entire underfloor construction is sealed with pressure-tested, airtight compartments. Further foam-filling of the upper coamings is available as an option, aiding positive upright buoyancy if required. Ventilation and vision can be a problem with some hardtops, but the big side-windows on this White Pointer allow plenty of air in, and you can stick your head out for night vision. I highly recommend a freshwater windscreen wash for all hardtop boats and White Pointer includes it in the options list. There is a drain that runs across the back of this hardtop — a small but practical feature. The hardtop also has a rocket launcher and work lights as well as a radio console above the windscreen. The inside of the hardtop and cabin are fully lined. There’s a big, flat retained dash area to keep all those knick-knacks, plus a passenger Jesus bar and another solid handle under the roof for a standing passenger. The dashboard is simple but effective, with plenty of room for the new 12in Garmin GPSMAP 5012 3D marine navigator. 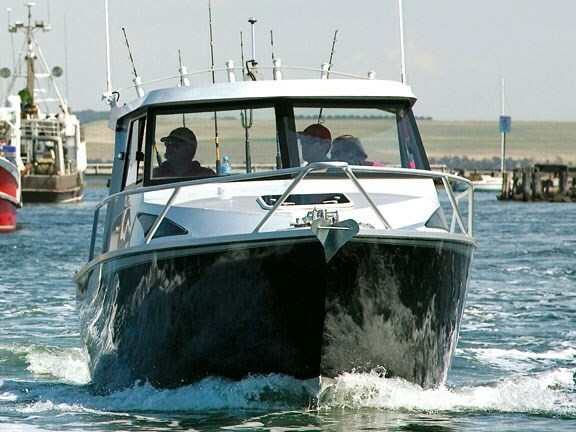 You can comfortably lock yourself into the helm for full control in heavy seas, and all of your controls and gauges are within easy sight and reach. The big, deep cabin has plenty of room for two adults and this can be enhanced with a drop-in bunk infill. There’s an optional Porta-Potti or electric flush toilet. A third hammock berth also doubles as rod storage. If extended trips are envisaged, fridges, freezers and galley units can all be custom-fitted as required — just a few from a huge list of optional accessories. I’ve noticed over the years that Kiwis take a real pride in their workmanship, and the White Pointer 750 Sports Hardtop is testimony to that dedication. Company founder and managing director Rex Briant tells me that "fitout is the bones to longevity". He backs that up in the construction process by fitting all options and accessories to the bare hull, before removing them all prior to painting. This ensures a premium fit-up that is free from contaminants such as drilling and grinding swarf, which can cause electrolysis. All bolted features are sealed with LanoCote to avoid seizure, while a range of metals are galvanised. This extra care means White Pointer provides a 10-year construction warranty on the hull, and 12 months on the custom White Pointer aluminium trailer. See White Pointer boats for sale.